(DES MOINES) – Gov. Kim Reynolds and Lt. Gov. Adam Gregg released the results of the annual Iowa Governor’s STEM (Science, Technology, Engineering and Mathematics) Advisory Council independent evaluation. The report measures the success of the STEM council’s efforts in advancing STEM education toward economic development across the state. 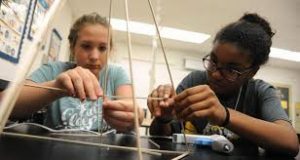 Students who participated in STEM Scale-Up programs scored an average of three percentage points higher on the Iowa Assessments in math and reading and four percentage points higher in science compared to all students statewide. For minority students, the growth was even stronger: six percentage points higher in math and reading and seven percentage points higher in science. Students participating in STEM Scale-Up programs were also more interested in someday working in Iowa compared to all students statewide. More than 75 percent of all students statewide indicated they were very or somewhat interested in science, technology, engineering or pursing a STEM career. In addition to the Council-driven gains, evaluators also found more students are taking Advanced Placement (AP) STEM courses, more females and minority students are pursuing STEM degrees at Iowa’s public universities and more than nine of every ten Iowans agree an increased focus on STEM will improve the state’s economy. The Iowa STEM Evaluation is conducted by an inter-university consortium of Iowa State University’s Research Institute for Studies in Education (RISE), University of Iowa’s Iowa Testing Program and the University of Northern Iowa’s Center for Social and Behavioral Research (CSBR).